Right around the same time that I was developing my thoughts about Compassionate Authenticity and daydreaming about beginning to write, I picked up Brene Brown’s book,The Power of Vulnerability. I only read a few pages, but immediately I was heart broken. It seemed as though she was already saying much of what I wanted to say. My sense of mission fizzled. I stuffed the book far under my bed, where it has remained, in all honesty, unread. Yup, I recommend this book weekly to clients, and yet I haven’t read it myself because it triggers my own inner demon – that one that says “You have nothing useful to say because what you are thinking has already been said.” That’s an ugly, silencing demon, isn’t it? 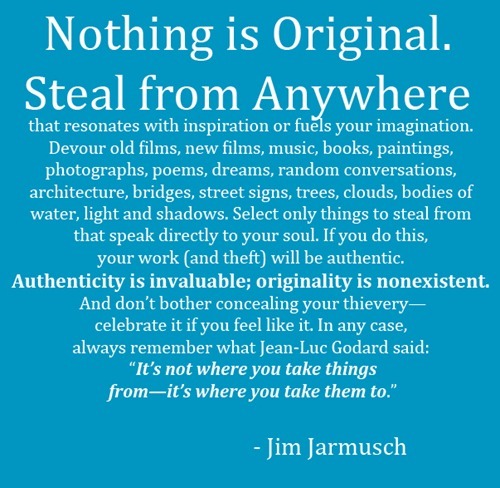 Who ever taught us that everything we produce has to be original to be valuable? Funny story – when I was in high school, my English class had to keep a weekly journal. One brilliant character amongst us (that’s you, Kirk) wrote a page about the evils of plagiarism, and then circulated it to every single student in the class; each and every one of us copied it word for word into our journals. The teacher was furious and gave us all failing grades for the entry. What a missed opportunity to reward creativity, humor, teamwork, and yes, originality!! That team project was a very original idea. This wasn’t a case of getting the assignment wrong; the fact that we were all saying the same thing was proof that we were doing something right. I’m steeping in the realization, lately, that this is often true. When we see the same truth as someone else, it’s not evidence that we are unoriginal…it’s a sign that we are on the right track! When we hear repetitive messages about health and well-being, when various and sundry schools of spiritual thought deliver similar messages, and when scientists repeatedly make the same discoveries, those teachings and discoveries don’t become less powerful, they become more powerful! They assure us that there is a truth that many people are working to articulate, each with their own language and imagery and narratives that are resonant for different people. Imagine if you could break free from the reigns of stymying and unnecessary competition. Imagine if you could let yourself ADD your voice rather than comparing and deleting your voice. Let yourself speak. Even if what you’re saying has been said before. Because you know what? It’s never been saidyour way, by you, in this moment in time. So someone new may hear it. Or be newly inspired or educated. Someone new may get it. And here’s the thing. Even if nobody reads your words or hears your speech or attends your workshop, even if nobody understands your musings or agrees with your mission, and even if everyone has heard it a hundred times before, what happens on the receiving end of the message isn’t what matters most, anyway. What matters most is what happens to YOU when you give yourself voice. If you have something to say and it makes you shine to say it, then say it! 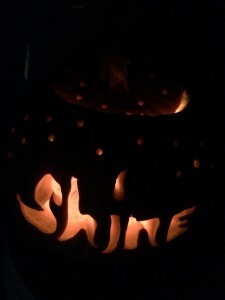 If there is something you do that makes you shine, then do it. It doesn’t matter what lights you up – mechanical manuals, the link between body and mind, the possibility of life on other planets, the biosphere that exists in the moss on a fallen log, balancing rock towers on the river’s edge, teaching kids about new technology – it doesn’t matter. And it doesn’t matter if someone else is already doing it. What matters is that it makes you shine. And when you brighten, you emanate clarity into the world; when you let your authentic self be seen, you give the most compassionate gift available to give — light. And spreading the light is not a race or a competition. In fact, the more lights we shine, the brighter the world gets. It’s not a competition…it’s a team effort.